Claudio was really happy with the way the work had been allocated. Of everything that needed preparing for the birth of Jesus, he had been given ‘the speaker’. But it wasn’t just any speaker: it was the speaker through which the voices of the angels and God himself would be heard on Earth from Heaven. Claudio was just an ordinary angel but had been very lucky because the bulk of the important tasks had been given to the most impressive and brilliant archangels and to other more senior angels. As everyone already knew, he was more than just a charming angel: he was also a whiz with technology, which is why they thought he would be ideal to create such a complicated device. Claudio had a thousand ideas for the design in his head and he set to work immediately. He hadn’t been working long before Raphael, one of his favourite archangels, came along. "Can you please give us a hand with the palace, Claudio? We need a door that opens automatically for Mary and Joseph." "Of course!” – He said, willingly as ever – “this can wait." It took Claudio several days to finish the complicated door, and even more to complete the other jobs that Raphael kept asking him to do. But it was all worth it: they built a palace worthy of the greatest king on Earth. It was so good that, when no one was looking, the angels came out of heaven to admire it. Claudio was walking back so he could work on his speaker when Michael the archangel spotted him from afar. Even though it took several days to finish the costumes, they could not have created anything more beautiful. Angels came from every corner of the universe to marvel at their beauty and congratulate Michael warmly. Gabriel also asked Claudio to help him with the lights and sound effects for the heavenly choir. Then the cherubs arrived asking for lots of help, as did large numbers of senior angels with jobs so important that Claudio had no choice but to assist them. Everything was perfect. 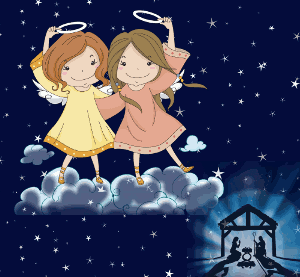 The angels were happy and congratulated one another proudly. That same night, the eve of the birth of the baby Jesus, they celebrated with a big party. But Claudio couldn’t go. After so much work, he remembered that he had his own job to do - the speaker- which he had still not started! Alone and in a hurry, Claudio worked on his speaker and could hear the background music from the party. He had tears in his eyes as he worked, knowing he wouldn’t finish on time. Suddenly God himself appeared by his side. "Hello my dear Claudio. What are you doing here and not at the party?" The little angel felt ashamed and, holding back the tears, showed him the partly finished speaker. "I see. I know that you were busy helping others. But is no one coming to help you?" "Well, they are celebrating at the big party and they deserve it", answered Claudio. "They have worked very hard and everything has turned out brilliantly. Also, they couldn’t help me even if they wanted to: this speaker is very complicated." "Hmmm" was the only thing God said as he turned around. He didn’t seem very happy. Claudio didn’t have time. He had just finished putting the pieces together in time and he managed to reach his place by the skin of his teeth, just as Gabriel was giving the signal to begin. The choir cleared their voices and for a second everyone was looking at Claudio. He closed his eyes, said a prayer and put the speaker on full volume. A huge explosion shook Heaven as it opened up to send the angels’ hymn to Earth. The explosion was so great that it was like an earthquake or a hurricane on Earth, destroying all the preparations. The palace collapsed completely except for the remains of a few walls. The place felt cold, uncomfortable, dirty and untidy. Even the beautiful clothes of all who were there to witness the birth flew across the air, now nothing more than rags. In a matter of seconds, all that remained intact were the voices of the heavenly choir and a bright flash from the huge speaker which was slowly burning. No one in Heaven dared say anything. Claudio was very embarrassed. Everyone was looking at him in pity and disappointment but they too were embarrassed for having left him all alone. Just then Jesus was born but instead of the cries of a baby, which was what everyone was expecting, happy laughter filled Heaven and Earth. It was contagious laughter, letting them know that, although things had turned out poorly, God was happy with the preparations done largely by Claudio, who had forgotten about his own problems to help everyone else. And as if they had expected something like this would happen, the three archangels whispered to themselves: “This is truly God’s way: everything has turned out perfect”.